WASHINGTON – While Congress opted not to wade into the controversy over the nearly $5 billion in airline fees collected annually, passengers will find other victories in the compromise legislation agreed to over the weekend to reauthorize the Federal Aviation Administration. The FAA reauthorization bill would require the agency to issue regulations establishing minimum seat standards – something many passengers have begged for as seat width and the distance between rows have shrunk. The FAA, however, has argued that it is a safety agency rather than one that regulates passengers' comfort. But a passenger rights group that unsuccessfully sued the FAA to force it to take a stand on seat size said the legislation is no guarantee of relief for consumers. "The problem I see is that it could give the FAA the ability to simply reiterate their current position, which is that seats are safe and (the FAA) has nothing to do with comfort," said Paul Hudson, president of Flyers Rights. "I can see us going around the block on this for a year and then coming back to exactly where they are now." For those who fear that their already uncomfortable flight will be made even more so by passengers yapping away on their phones, the bill would also ban passengers from talking on cellphones (and using e-cigarettes) while flying. Faced with a Sept. 30 deadline to reauthorize FAA funding, Congress is expected to meet this week for a pro forma vote on the bill from the conference committee. The bill would also prohibit passengers who have boarded a plane from being bumped to accommodate other passengers, acknowledging the debacle that took place in April 2017, when David Dao refused to give up his seat on a United Express flight. The airline was the subject of outrage from the public and Congress, and its chief executive was forced to apologize, after cellphone video of a bloody and dazed Dao being dragged from the plane was viewed by millions online. The provisions were among hundreds in the 1,200-page FAA reauthorization bill, which would continue the agency's funding for the next five years. Cut from the bill, in an 11th-hour conference committee decision, was a provision that would have let the Transportation Department decide whether the $4.6 billion that airlines collect each year by charging fees for baggage, changes and seat assignments, among other things, was "unreasonable." –Says passengers must be allowed to check strollers when flying with a small child, and pregnant passengers can board ahead of others. –Would let the Transportation Department determine whether airlines are shading the truth when they say "that a flight is delayed or canceled due to weather alone" if other factors entered into the decision. –Would require airlines to refund fees to passengers for things they don't receive. –Would make it illegal to put a live animal in an overhead bin, the legacy of Kokito, a 10-month-old dog that suffocated in March after a United flight attendant insisted that its carrier be stored overhead rather than underneath the flier's seat. –Would create an aviation consumer advocate. –Would allow flight attendants a 10-hour rest period between flights, rather than eight hours, from the time their flight touches down until their next takeoff. "Most flight attendants were lucky to get five hours" of sleep, said Rep. Peter DeFazio of Oregon, the ranking Democrat on the House Transportation Committee. "This will match (their sleep time) with the pilots. They're both safety-critical professionals." In addition to funding NextGen, a $36 billion collaboration between the FAA and airlines that aims to modernize air travel, the bill would instruct the agency to prepare for a return to supersonic air travel and to create an Office of Spaceports. More than one nation is considering a return to supersonic flight for the first time since the Concorde retired in 2003, after the crash of an Air France flight killed 113 people. In fact, a Boeing 787 Dreamliner with a strong following tail wind reportedly came close to supersonic speed in January. The Office of Spaceports would provide federal oversight to the state and local concerns that have been launching rockets, most of them privately owned, into space. The bill would also provide greater regulation of unmanned aircraft – drones – and instruct the FAA to refine standards for their operation. It would allow the government to shoot down a drone that "is identified as high-risk and a potential target for unlawful unmanned aircraft activity." Another provision of the bill would instruct the FAA to take a thorough look at cockpit security, considering whether a protective screen might be put in place when pilots use the restroom at the front of the plane. "The menacing flight attendant with the food cart" wheeled into place at the head of an aisle "is not adequate for any trained or determined person who wants to get access to the flight deck if the door is open," DeFazio said. 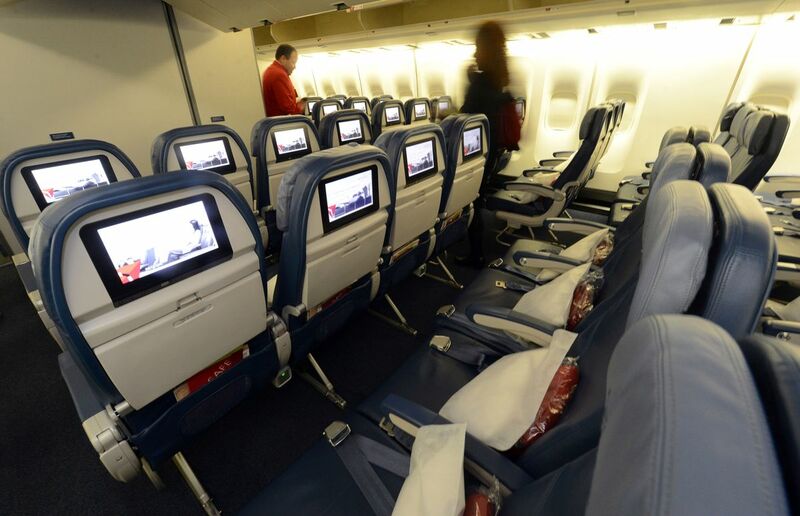 Members of Congress noticed and complained when seat sizes and the distance between rows (known in the industry as "seat pitch") became too close for their comfort. The FAA, however, took the position that it is a safety agency, and so long as passengers could safely exit their seats in an emergency, seat size and pitch were matters to be decided by airlines and passengers. Faced with a federal court ruling that it consider regulating seat size and pitch, the FAA concluded in June that there is "no evidence that a typical passenger, even a larger one, will take more than a couple of seconds to get out of his or her seat" in the case of an emergency. "We are aware of the provision on regulating seat size dimensions in the compromise FAA Reauthorization bill that the House and Senate plans to consider this week," the FAA said in a statement Monday. "Since we are currently reviewing the legislation, we will not comment on how we plan to implement any particular provision at this time." Seat width on many major airlines has shrunk from about 18.5 inches to 17 inches. Seat pitch – the distance between your seat and the one directly in front of you – has decreased from an average of 35 inches to 31 inches, and on some airlines it has been reduced to 28 inches. "They haven't done a real evacuation drill in 15 years," DeFazio said. "It's all computer simulation, and they're cramming in more and more seats, and they're smaller and smaller as people are bigger and bigger." An amendment to the bill also allocates $1.68 billion in relief for those affected by Hurricane Florence and other natural disasters.